TORONTO -- One of America's most controversial clothing brands is making a comeback, but ditching some of its signature traits. This time the brand will be Canadian-owned and for now, won't have any physical stores in the country, said American Apparel's brand marketing director Sabina Weber, who indicated the company was taking a careful approach to its relaunch as it measured how its customers have changed. "It is kind of like putting yourself back out in the dating world. You don't know if someone will be interested or not," she said. "We know Canada is a huge market for us. They have always been so supportive of the brand." 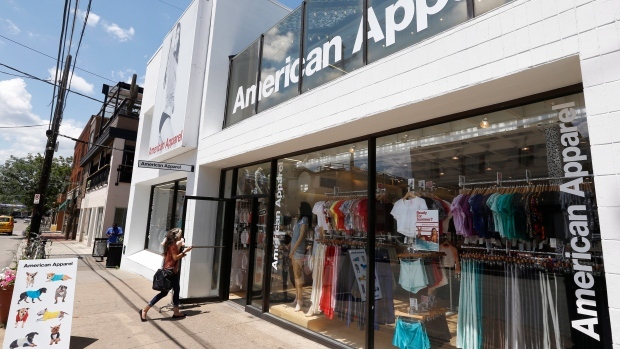 American Apparel was founded in 1989 with a "Made in America" ethos and a proclivity for using its clothing to champion immigration, LGBTQ rights and diversity -- values that are sticking around. It was known for selling basics, including its popular unisex hoodies, bodysuits, tights and leggings, but caught criticism with its provocative advertising that often featured scantily clad women in suggestive poses. "The interesting thing about Me Too is that the evolved thought is that a woman is allowed to dress the way she wants to dress. It is really holding men accountable for their actions," she said. "A woman being demure does not mean she is empowered. What is empowered is seeing yourself and being free to be yourself." Gildan nabbed American Apparel's intellectual property rights and some manufacturing equipment from its Los Angeles facilities -- but not the leases for the manufacturing or distribution centres-- for US$88 million, some US$22 million more than a stalking horse offer it made months earlier.